A mere week after migrating my 2 500GB Seagate Barracuda drives to my new Synology DS210j I came home to an angrily beeping NAS. Checking in with the Storage Manager app showed that my RAID volume was DEGRADED and horribly bad things were IMMINENT. A bit of investigation (ie. clicking on the SMART Info tab) showed that my Reallocated_sector_ct had dropped below the threshold (or risen above it... hard to say really) and the NAS was in no way going to let me use that disk. Although fairly confident the disk is likely still good, there's no arguing with an angry NAS, so I shut the thing down and ordered a new drive. Given the current pricing, a 1TB was practically the same price as a 500GB so I picked up a 1TB Western Digital Caviar Blue drive. 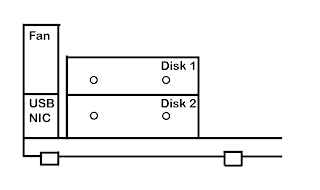 The first trick was to determine which was Disk 1 (the bad) and which was Disk 2 (the good). The information is squirreled away in the installation manual so I shall present it here instead. 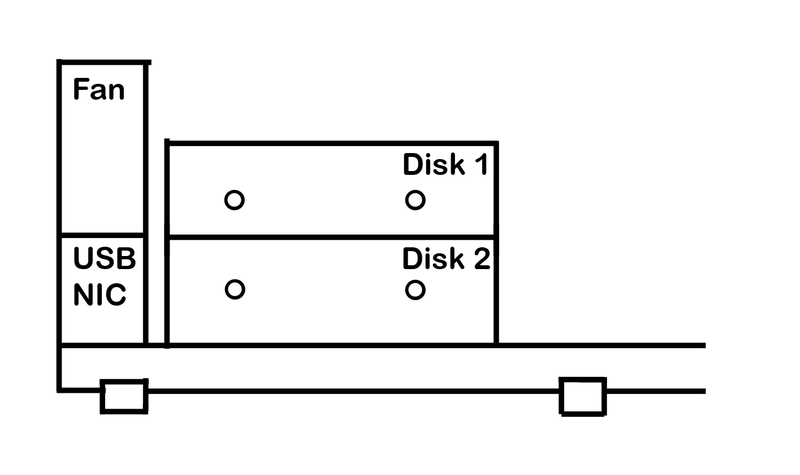 It's not exactly a page from their CAD design but you get the picture that Disk 1 is the one furthest away from the little nubbly bits at the bottom. With that mystery solved, I pulled out the bad (Disk 1), moved the good (Disk 2) into the driver's seat (ie. it in slot 1) and put the ugly (new drive) into slot 2. The WD really is pretty ugly, when you look at it, especially compared to the svelte Seagate drives. I digress. Rebuilding the volume was easy peasy though. In the Storage Manager app, going to Volume, selecting the unhappy volume and then Manage I was given a "Repair" option. It showed me my options for repairing the drive, which in this case was just the WD drive, and after hitting Apply the beeping stopped and the NAS happily went about repairing the volume. So, all in all, I'll give it +2 for letting me know so quickly that my drive had issues, but -1 for not letting me decide my own level of risk for the volume. I will do some tests on the "bad" drive to see how bad it actually is. UPDATE: I downloaded and ran the excellent SeaTools disk test suite and it, too, was unequivocally warning me not to use this disk. I then discovered that the drive was still under warranty from Seagate (you can find out by entering your s/n on their site) so now I have a factory refurbished 500GB drive sitting on my desk. The NAS is chugging away happily with the 1TB so I guess I'll keep it around in case of another failure.